Holy wow. Just a round of applause for that premiere overall, right? There was a lot I couldn’t discuss with the early review, but man if “No Way Out” didn’t work tirelessly to elevate everything around it, from that jaw-dropping rocket launcher cold open to the final, thrilling battle sequence at Alexandria. This was The Walking Dead as we’ve always wanted it, bringing renewed energy and style to what’s likely to become a huge turning point for the series. Too often The Walking Dead struggles with making support characters matter, and that doesn’t get any easier introducing an entire community’s worth of zombie chow, given how forgettable extras at the barn, prison or Woodbury tended to be. In a way, that actually worked in tonight’s favor, that apart from the obvious ends of Jessie, Sam and Ron, none of the Alexandrians seemed to suffer any losses, keeping emphasis on the idea of these two groups finally coming together. The Walking Dead can lose sight of specific points amid all the carnage, and “No Way Out” seemed to put in extra work redeeming burdensome characters like Gabriel and Eugene, leaving none of the townspeople out of its ultimate conflict. If you’re familiar with the books, the loss of Jessie’s family wasn’t much of a shock (at least someone had to go during the zombie stroll), and the story wouldn’t have left us on the 2015 cliffhanger at all if not to come back with a body count. It’s a particularly harrowing sequence to boot, switching to nightfall, and making strong use of jump scares and the stylistic gnashing teeth edits as Sam remembers Carol’s warning, even if it does illustrate one of the premiere’s few failings. 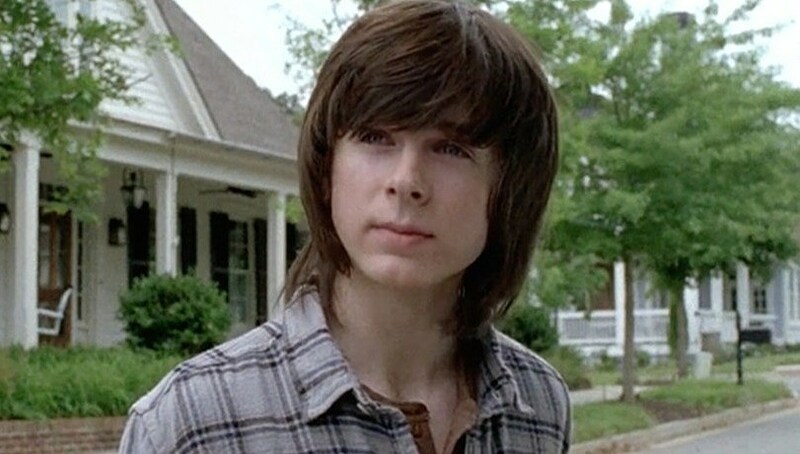 It felt like The Walking Dead had only just begun to explore Rick’s relationship to Jessie and her children, to now stop development cold in killing them all off, and shifting pretty much all concern to Carl’s injury* anyway. *The gunshot appeared notably less severe than it was in the books, but it’s a definite surprise for The Walking Dead to commit to such a significant injury for a character unlikely to be killed off anytime soon. Even Scott Wilson got to walk around unencumbered with a prosthetic leg in Season 4, but hopefully Chandler Riggs doesn’t regret taking on an eye patch or additional makeup for the remainder of the series. Unless someone’s hair is about to get even more awkward shag. In the same way, “No Way Out” seemed ultimately to abandon the surviving Wolf thread, briefly redeeming the character and fostering our interest, only to kill him off and grant one final zombified reunion with Morgan. Obviously, the Wolf served a larger focus in highlighting the moral divide between Morgan and Carol, but as far as real estate within the hour itself, much of “No Way Out” felt like cleansing all lingering threads of Season 6, and shifting into a new era. The same could be said of the Glenn-Enid pairing, which seemed tonight only to wax poetic once more about the nature of grief-fueled survival, place Glenn in jeopardy once more, and rescue Maggie from some unclear peril. Best of all, the premiere still managed to set up new territory to explore in the process of sweeping out all the old. Negan’s motorcycle crew were certainly dealt a setback, albeit one likely to resurface before long, while the one holdover thread that didn’t garner mention was Daryl’s mysterious captors. There’s Carl’s recovery, Rick’s new role as a reborn Alexandria’s leader, plenty more interpersonal relationships to explore, and even if the remainder of Season 6 can’t quite live up the same heights, this was just a gorgeous hour of television overall. Nicotero’s direction in particular crackled with energy (gonna need that rapid-cut of everyone slashing on a GIF loop), while the hour itself was rife with style and some seriously black humor. Unquestionably The Walking Dead’s finest hour, and tremendously inspiring for the series going forward. I have never laughed, or cheered harder than Daryl taking out Negan’s gang with the rocket launcher. Gonna miss that creepy little dude, though. Was there a reason Maggie couldn’t get off the platform, and onto the wall? Enid didn’t appear to have any trouble. Welp, so much for zombie Deanna showing up. It was at least a little jarring to find so many supporting Alexandrians holed up, given how little the finale established everyone’s safety. So there were only two RPGs in that case, right? Shame. The Walking Dead will return on February 21 with “The Next World”, airing at 9:00 P.M. on AMC.